Hello my crafty friends! Laura, here today with another fun, dimensional card tutorial. Yes, you arereading the right blog. I know it’s not my regular post day, but I just couldn’t wait to share my third card using the Cabana Tile Dies from the awesome Catherine Pooler Tropically Yours Stamp of Approval Box. If you haven’t heard about this box yet, you need to keep reading, my friend! Its a collection of stamps, dies, stencils, and more – all specifically designed to work together. It is only released every quarter, and what’s included in the box changes each time. 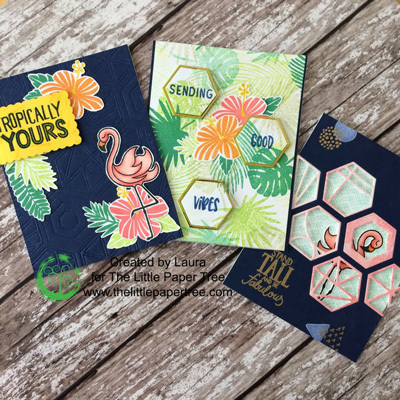 The Tropically Yours collection includes SIX stamps (including a larger 6×8 set and a super cool, grunge background stamp) and a die set that has six hexagons, each with different geometric designs inside them. In my previous postI share two way to use this wonderful die set to create two completely different cards, and today I’ll share yet another way to use this versatile die! First thing I did was to create my top panel. I did a quick watercolour background on some Ranger Watercolour Paper using the latest Catherine Pooler Ink in Coral Cabana. To create the wash, I just smooshed the inkpad onto my glass mat, then spritzed with my Distress Sprayer to get the colour moving (and to dilute it to a softer shade.) Using a flat paintbrush, I loosely covered parts of a 4.25” x 5.5” panel. I actually made several watercolour panels at the same time but you will see the outcome of them in another post. 😉This was the panel who’s destiny wasn’t to be the star of the show as a background panel but don’t worry! It had a bright future in the supporting role as die inlays. Making all the various parts of this dimensional card was easier to do since I used the dies while they were still attached together (as they came in the packaging.) I did snip off one of the hexagons (that was similar to one of the others) off the end so I was die cutting the five-hexagon pattern all in one pass of the Cuttlebug. Actually twice since I did this once over the watercolour panel I’d just created, and again on an A2 panel I cut from navy card. On the navy panel, I cut it at an angle as I liked how that looked with my design. Still working with the navy panel, I stamped some of the solid geometric shapes from the Fearless Pursuit stamp set using Lawn Fawn Yeti Pigment Ink. I used my stamping tool for this as I wanted a more solid coverage of the white ink on this dark background and could make two stamp impressions in the exact same place.I set the ink with my heat tool in between each layer to speed up the process (and, I’m convinced white pigment ink will stay wet forever if you don’t dry it with a heat tool!) Once that was dry, I used my powder tool and stamped the rest of the dotted, coordinating shapes as well as a lovely sentiment (from the Stand Tall stamp set) in Versamark before heat setting with Ranger Gold Embossing Powder. This next step is one that I think is crucial… and yet I totally forgot it until I was halfway through the painstaking job of sticking tiny foam squares on all the fiddly bits in, and around the hexagons. I don’t want to blame my darling daughter for distracting me but it was most certainly her fault. You WILL save yourself tons of time if you do one simple step: adhere a piece of acetate behind the die cut-out on the navy card. This will help stabilize the thin areas the die cuts. I didn’t want the incricate die panel to cave in! It took FOREVER to cut, apply, and remove the backing paper from each little piece, so I would highly recommend you use acetate and that will help tremendously. You might want a few little support pieces (of foam tape) here and there but it won’t be as traumatic as the amount I had to apply! Another perk of the acetate is it’ll give you something to adhere the watercolor die cuts into the cut-out panel. As it was, I just used all that tiny foam tape to keep them in place. With the cover panel complete, I moved onto what I wanted to feature behind my hexagon windows. I chose this lovely thatched pattern from the Good Vibes Border stamp set. As its only a border stamp, it is thin but no worries. I just inked it up with Cracked Pistachio Distress Ink and stamped it (vertically) all along an A2 panel cut from Neenah Solar White. I didn’t measure anything, and instead eyeballed lining it up with the row next to it (overlapping them slightly) and kept going until the whole panel was covered. Over on another piece of Neenah Solar White, I used Memento Tuxedo Black ink to stamp a proud flamingo from the Stamp Tall stamps set. I colored her body in using Copic Sketch Markers in R32, R20, R00. For the beak I used YR18 and YR14. I cut her out with a pair of scissors and used Tombow to adhere her to the stamped background behind the die cut out. I used more Tombow to adhere the panel to a card base made from Neenah. All that was left to do was to take the backing off the millions of pieces of foam tape on the top panel and adhere that to the card base. Yay! That’s that card, done! I know that was a lot of information, and I thank you for sticking with me today! I hope you are finding lots of inspiration for the new SOA collection over on the blog, the design team’s Instagram accounts, and in our Facebook group The Little Paper Treehouse Tribe! I’d love to see any makes you’ve been working on lately! If you want to buy the Stamp of Approval box, better hurry! There’s a limited supply so order soon so you don’t miss out! And Don’t forget to use TLPTLAURA10 for a 10% discount at checkout!